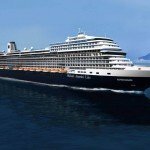 As the largest Holland America Line vessel to ever call Australia home, MS Noordam has been an exciting upgrade for loyal passengers on which to sail locally. 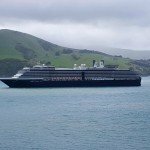 Launched in 2006 and arriving in Australia in 2015, the local upgrade has allowed the line to showcase many of its newer signature elements which weren’t offered aboard Oosterdam, Holland America’s previous Australian based ship. One of many exciting differences between the two sister ships is the higher number of suites on Noordam, while passengers will also notice an improved Neptune Lounge for those calling the ship’s higher-tiered accommodations their home. 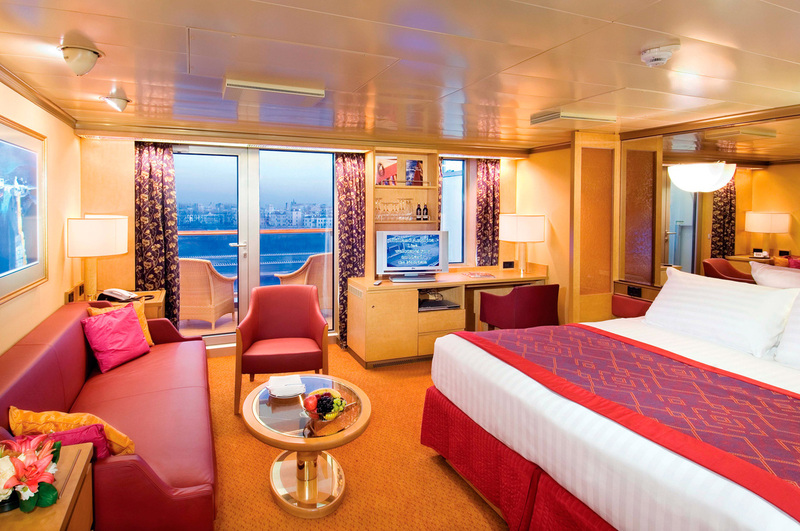 Let’s take a look at the various stateroom and suite categories you’ll find on MS Noordam. Where will I find them? Decks 1, 4, 5, 6, 7 and 8. 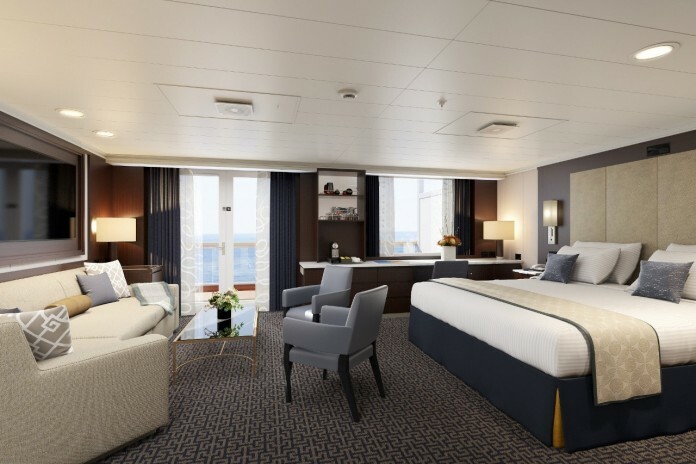 Located throughout the vessel, interior staterooms mark the entry level accommodations offered aboard Noordam. They come in two sizes. First, “standard” interiors are around 150 square feet and “large” which are around 250 square feet in size. 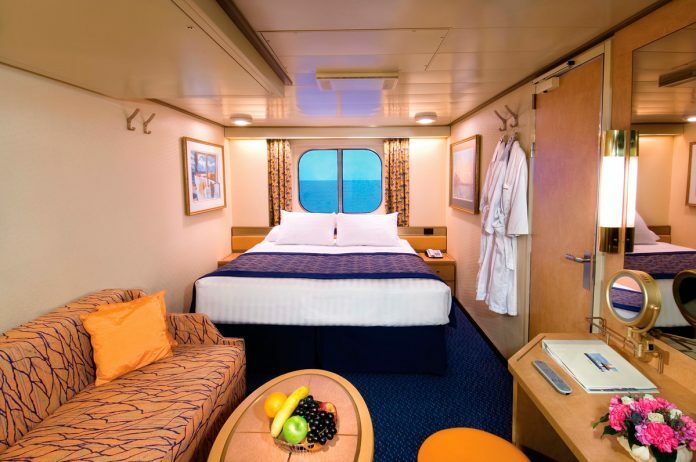 Large sized interior staterooms – which are priced under the “J” category are found exclusively on main deck, with many of the oversized accomodations offering space for three and four guests. 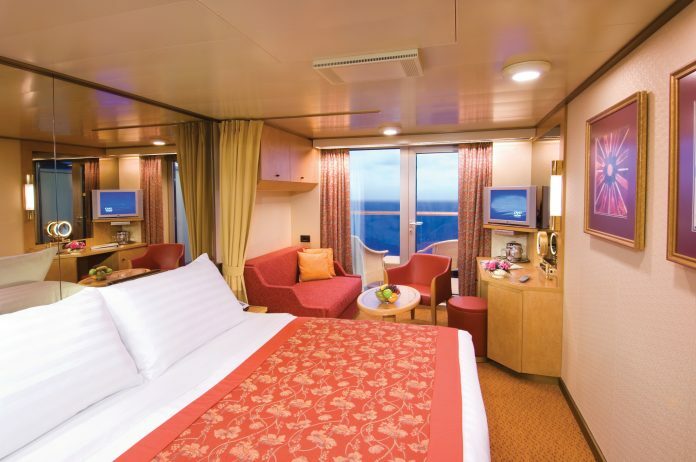 An example of a standard oceanview stateroom on Noordam. Where are they? Deck 1 and Deck 4 (Obstructed). Often priced at only a few dollars more than interior staterooms, any disappointment which may eventuate from booking an Obstructed Ocean View stateroom can be easily offset once you discover they can be some of the largest standard staterooms on the vessel. Many of these boast a large floor-to-ceiling window, allowing natural light to flood the stateroom. The only detriment is the increased likelihood that a lifeboat or another piece of safety equipment slightly blocking your view – for what time you actually do spend in your cabin anyway. Varying degrees of obstruction can occur so consult a deck place to try and work out which staterooms are between life boats and offer the least impeded view. 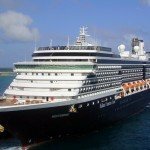 Being a newer ship, the emphasis on Noordam is on balcony and suite accommodations, with only a few Ocean View staterooms available on the ship’s lowest passenger deck. These staterooms sit at around 175 square feet and often sit below the numerous dining venues. Look at a deck plan carefully and have your travel agent try to work out what will be above your stateroom and whether any of that may disturb your sleep. A standard Noordam Balcony stateroom without obstruction. Where are they? Decks 4, 5, 6, 7 and 8. Like some other brands, Holland America Line refers to balcony staterooms as “verandah staterooms”. Located the length of most of the upper passenger decks, Noordam features more balcony accommodations than any other stateroom type. Pay particular attention to the cheaper grades of balcony stateroom. These feature steel balcony fronts and can impede your view if you like to sit in a chair and watch the ocean pass before you. Pay careful attention to your cabin positioning, as cheaper mid-ship balconies often have slight view impediments by things such as lifeboats and other safety equipment. The bedroom of a Signature Suite aboard Noordam. Where are they? Decks 7 and 8. On the size spectrum, your lower-tier suites sit just above a Verandah stateroom, with the added perk of a much bigger bathroom and significantly larger balcony. Bathrooms features a whirlpool tub and separate shower and allow space for both occupants to easily get ready for formal nights, while the larger space of the cabin and its couch, table and balcony chairs also makes for a handy space to entertain a small group of your new cruise friends, should you choose to invite them inside. These suites are also great for guests travelling with a third person, with the sofa converting to a comfortable double bed. Where are they? Deck 7. Moving to the middle tier of Noordam’s suites, the Neptune Suites immediately strike travellers with a major increase in the space afforded. For kickoff, a separate dressing area and walk-in wardrobe means all occupants have the space they need to ensure a comfortable holiday. Add to that multiple showers and a king-sized bed, it’s no surprise these suites are amongst the most sought after at sea. Guests booking into these suites have access to the Neptune Lounge – an exclusive space open by invitation only to occupants of the Neptune Suites and their higher-tier Pinnacle Suite cousins. Once you’re in this lounge, you can enjoy free pre-dinner cocktails, canapés and special deluxe breakfast, depending on what time of the day you decide to drop by. 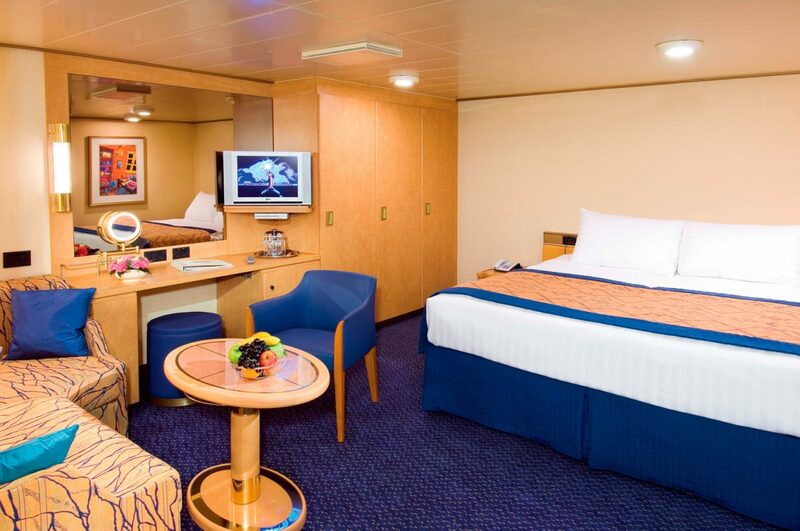 Other perks for occupants include complimentary laundry, and priority access to every service offered throughout the ship. Usually referred to as “how the other half live”, to most the opportunity to stay in something resembling the Pinnacle Suite is often out of reach. 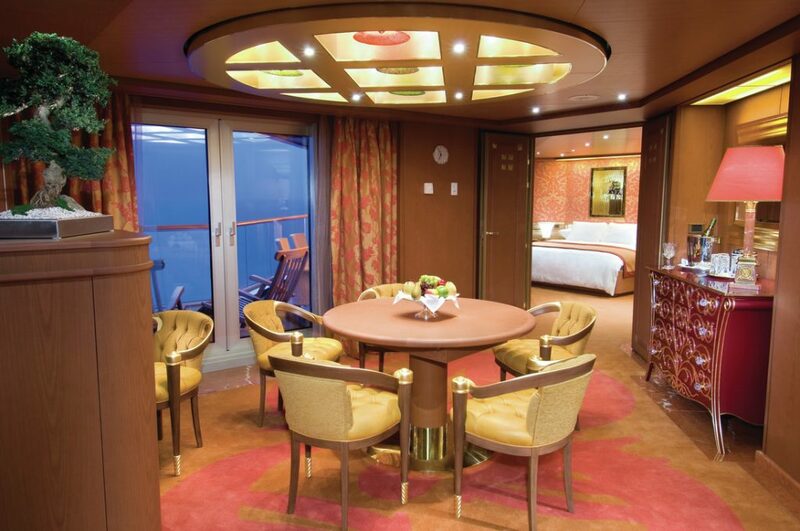 There’s no doubt the Pinnacle Suites on Noordam have that ‘died and gone to heaven’ feel about them. With over 111 square metres of space, a Pinnacle Suite offers a dining room, living room and even a pantry! It’s practically a residence at sea. So big are these accommodations, there is even sufficient space for its occupants to host a dinner party for up to four people. When none of the public dining rooms suit your occasion, create your own. The bedroom has a 42-inch plasma television to keep you entertained if the endless ocean vistas get a bit much. 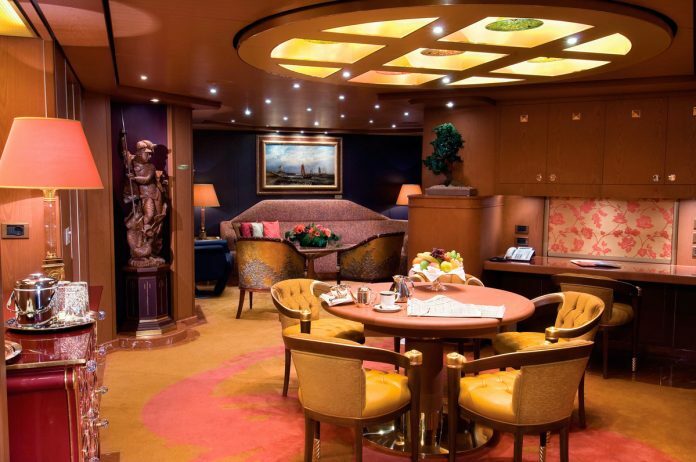 Access to the Neptune Lounge is included as is complimentary breakfast and lunch in the specialty dining venue Pinnacle Grill, known across the world as one of the most highly regarded restaurant options at sea.